If you decide to go to Peru you cannot miss a trip to the ancient capital of the Inca Empire Cusco (3,400m above sea level! ), also named Qosqo in Quechua which means “the belly button of the world”. Having my roots in this wonderful city I can’t recommend Cusco enough as a place to learn Spanish. Not only the setting in the middle of the mystical Andes is incredible but also the local people are very friendly and open to visitors. If, like me, you’re the kind of person who wants to be fully immersed in the language as well as in the local culture, then Cusco is definitely right for you! Cusco is simply full of Spanish colonial heritage, as well as Inca history, and is located not far from the world famous ‘lost city’ of Machu Picchu! 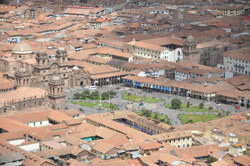 It all makes Cusco, in my opinion, the perfect place to learn Spanish and discover Latin America! There’s just so much to do in Cusco! After classes there are all kinds of activities organized by the school – kayaking trips or riding in a hot air balloon, guided tours of Cusco and much more! 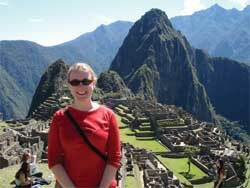 And of course a trip to Peru wouldn’t be complete without a visit to Machu Picchu! Walking the Inca Trail alongside breathtaking mountain views and cloud forests is simply amazing, …and the view you get as you approach this incredible ‘lost city’ is unforgettable!